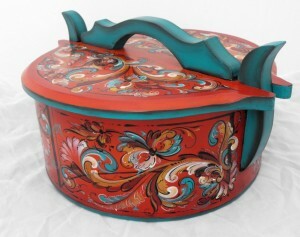 Rosemaling is a Norwegian decorative art, traditionally done on wood, that began its development in the late 1600’s. Due to Norway’s rich artisan heritage, this decorative painting was expanded upon and developed into numerous styles. It is a thriving art form with participants from all over the United States, Norway, Canada, Japan and many other countries. Copyright © 2019 The Art Of Lise. All Rights Reserved. Designed by bavotasan.com.